A woman was arrested on a flurry of charges after she fled from Leesburg police with two juveniles in a stolen car, reaching speeds of more than 100 mph on U.S. Route 62 before being thwarted by traffic near Staunton in Fayette County, police said. Leesburg Police Chief Shane Nolley told The Times-Gazette that Madison County authorities had been in contact with his department about a stolen vehicle suspected to be in the area, and when he received an anonymous tip that the vehicle was at Fairfield High School Thursday afternoon, Nolley went to investigate. When he located the vehicle, he found that the tags were fictitious, and the driver, who had a felony warrant from Madison County for fraud, was in the driver’s seat. 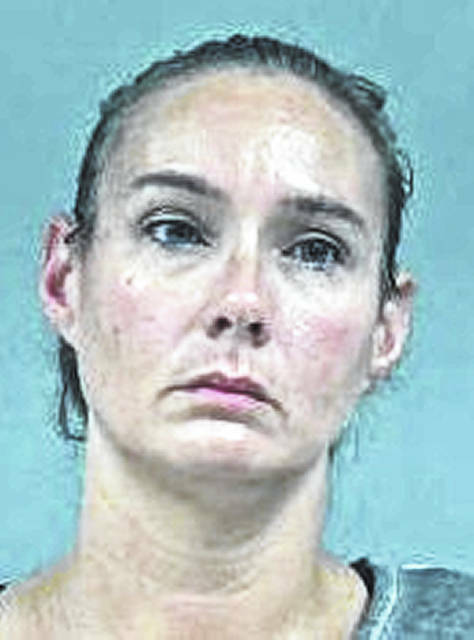 Nolley said he told Misty Cowan, 39, Leesburg, to shut off the vehicle, but she allegedly refused and took off northbound on SR 771 with two juveniles in the vehicle. Nolley said he pursued the vehicle through Leesburg to U.S. Route 62, where it headed northbound. It was then that the vehicle exceeded 100 mph on the U.S. route, the chief said, weaving in and out of traffic across double yellow lines. “It ended up just south of Staunton,” Nolley said. Fayette County authorities had placed spike strips in the road and traffic had become congested. The suspect vehicle became stuck between two cars, and Nolley was able to apprehend Cowan and place her under arrest. Highland County Children Services responded to the scene and placed the two juveniles with family members, according to Nolley. Cowan was transported to the Highland County Jail, where she remained incarcerated Friday, according to online records. She is charged with receiving stolen property, two counts of child endangering and failure to comply, in addition to fraud and passing bad checks in Madison County, according to the chief. Nolley said Cowan allegedly purchased the vehicle at a car lot in Madison County using a fraudulent check, and it was listed as stolen. Nolley said the Leesburg Police Department was assisted by the Highland County Sheriff’s Office, Fayette County Sheriff’s Office and Washington Court House Police Department. There were no reported injuries and Cowan was taken into custody without incident, Nolley said.